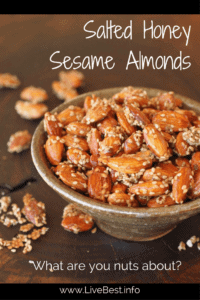 Salted Honey Sesame Almonds are a little sweet + a little salty. These quick-to-fix nuts are a great nibble, travel snack or when company’s coming. I read a blog post about why the author liked being an entrepreneur which made me think about myself. What is it that’s driving me to be my own task master? I like the flexibility to set my own hours. I’m pretty sure I’m spending more time at work and than when I was a full-time employee for someone else. But I like that I have been able to play tennis, take my dog on a walk, enjoy a cup of cocoa (or a La Croix) in the sunroom or on the porch, and work from anywhere. I like to travel and wanted my business to take to the skies. As a speaker, I’m honored that I’ve been invited to New York, Oregon, Arizona, Utah, Kentucky, Nevada, Iowa, Indiana, Maryland, Delaware, Rhode Island and beyond. I write about travel and my fun and favorite recommendations here. As an nutrition educator, I’m pleased that I’m impacting others with valuable information. I’ve spoken to thousands of people on rebooting your energy, productivity and focus; reducing food waste at home; and improving communication skills. I help women take the stage with confidence. My LiveBest webinar series and books Your 6-Week Guide to LiveBest, Simple Solutions for Fresh Food & Well-Being and LiveBest Seasonally are helping people improve their lives so that they live the life they want. From writing books and article to developing presentations. I like creating thing. As a food enthusiast, I create recipes that are delish and nutrish. I’m thrilled that my recipes and recommendations have appeared in Prevention.com, CookingLight.com, Shape.com, ReadersDigest.com, Women’sHealthMag.com, FitnessMagazine.com, Men’sFitness.com, EveryDayHealth.com, LuvoInc.com, FilmJournal.com, Walnuts.org and Casper Journal. I’m delighted that I engage with people all over the world. Let’s be friends on Facebook or subscribe to my recipes and updates. Connect with me on Twitter and Instagram @Judy Barbe. Have there been headaches? Absolutely. Plus I’ve been on a steep learning curve. Though overall, investing in myself has been a good investment. 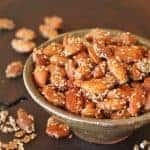 To honor the theme of what I’m nuts about, I’m happy to share these Salted Honey Sesame Almonds. A little sweet + a little more salty about sums me up. What are you nuts about? 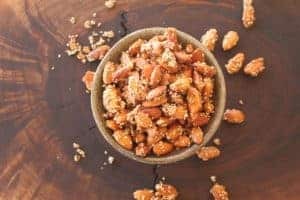 These nuts are easy to make for a quick nibble or when company’s coming. Spice them up with hot sauce if you like. Almonds pack some healthy punches. Protein, fiber, and 12 vitamins and minerals are just some almond’s benefits. The fat in nuts is the heart healthy monounsaturated kind. An ounce of plain almonds has about 130 calories. That’s about 23 almonds or 1/4 cup. If you’re at your desk, they’d cover a 3×3 Post-it note. 😉 but that’s 6 grams of protein and 3.5 grams of fiber. If you like honey in your snacks, you might like Honey Spiced Popcorn. This is a silicon liner, by Silpat. I use them when I bake fish, cookies and in this popcorn recipe. This post contains affiliate links which means if you click through and make a purchase, the seller may pay me a commission. It does not affect the price you pay. Pin it for later. Or rate the recipe below. Thanks! These quick-to-fix nuts are great as a nibble, travel snack or when company’s coming. Line a baking sheet with parchment paper or a silicon liner. 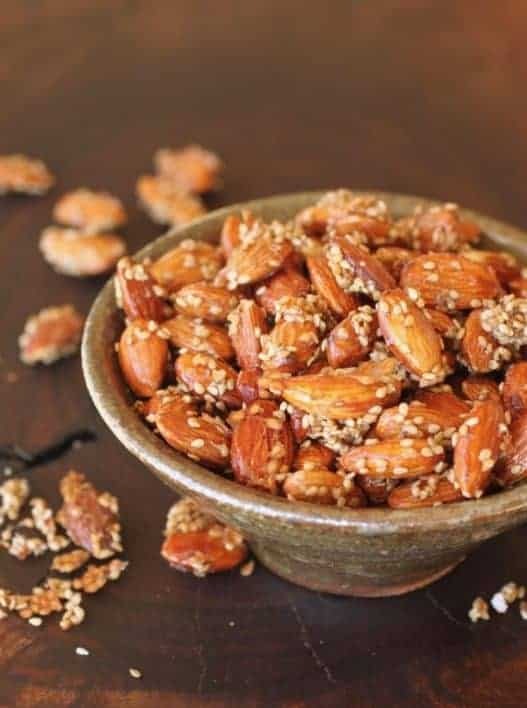 In a medium skillet, over medium-low heat, stir together all of the ingredients until almonds are coated with honey and sesame seeds, 2-3 minutes. Spoon nuts into a single layer on the baking sheet. Bake 10-12 minutes. Remove and to cooling rack. Nuts will crisp as they cool. When cool, break nuts apart. Store in a tightly covered container. Want heat? Add a dash of Sriracha, gochujang, harissa or other hot sauce when you stir the ingredients together.